Consuelo Mack: If you had one investment to make in a long-term diversified portfolio, this is assuming we all have long-term diversified portfolios, what’s the one investment we should all have in it? Mitch, do you want to take it first? Mitch Tuchman: Well actually, why don’t you start, Burt, because I liked your answer to that, and I had a way to hitchhike that. 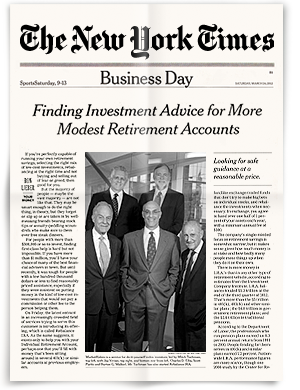 Burt Malkiel: Well, if I had only one thing that I could buy, I would buy a world equity stock fund. That is, a stock fund that had U.S., that had Europe, that had Japan, that had emerging markets, that had the entire world. Mitch Tuchman: Okay, so I’m going to hitchhike off of that and I’m going to agree and that is VT…Victor Tom. It’s a global index fund put out by Vanguard. But one of the things that we do for our clients is we say let’s open up a Roth IRA for your child and let’s put $500 or $1,000 in it and just buy VT and for a child, that’s one of the greatest gifts you can give them, not so much an iPhone and not the next crazy outfit. You put it in a Roth IRA and that kid will watch the power of compounding and start to understand how this works.